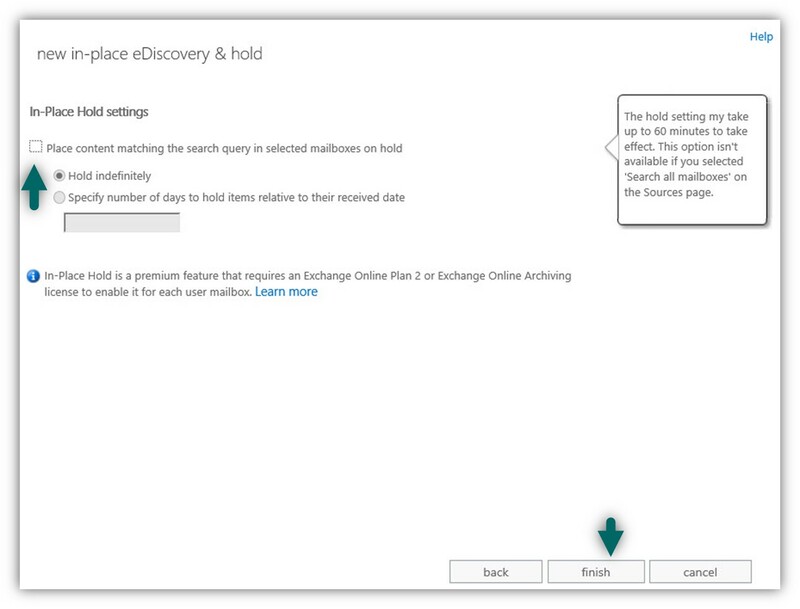 In the current article, we will review how to use the Exchange In-place eDiscovery & Hold feature as a tool for searching and recovering deleted mail items. How to create an Exchange In-place eDiscovery & Hold query. 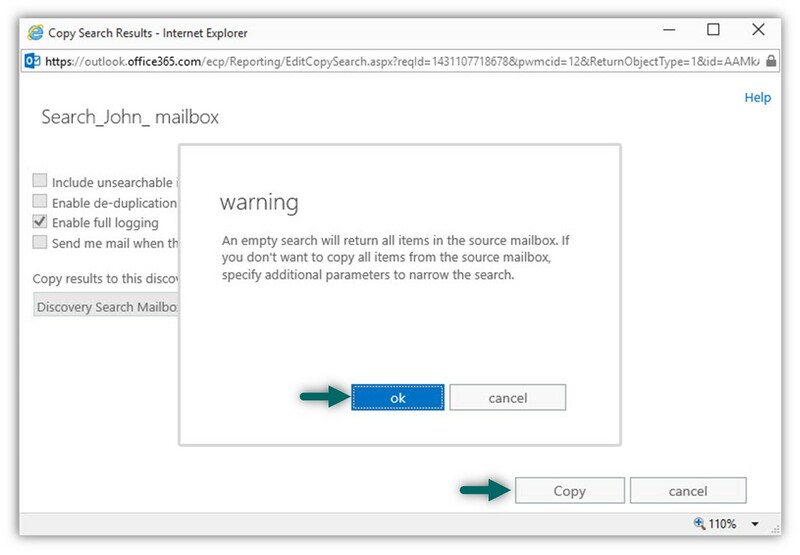 How to send a copy of the search results to the Discovery Search Mailbox. How to export the search results to PST file. 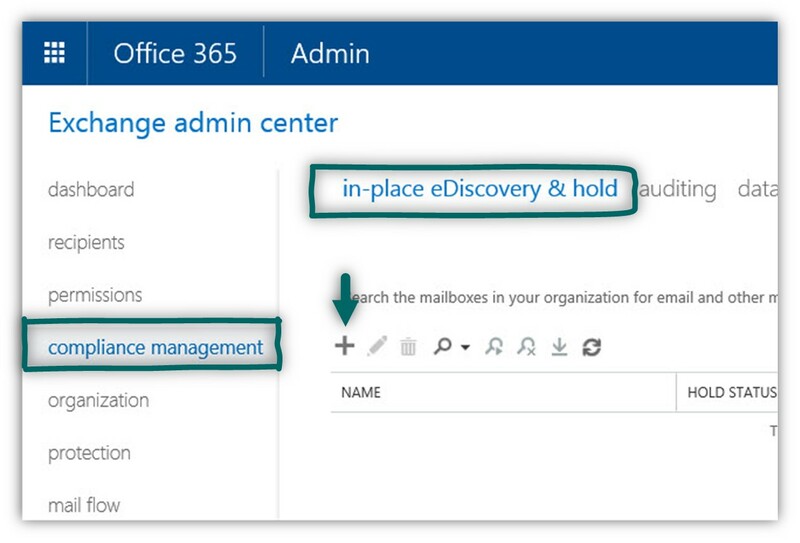 How to access the Exchange Online In-Place eDiscovery admin interface by Office 365 Business customers. 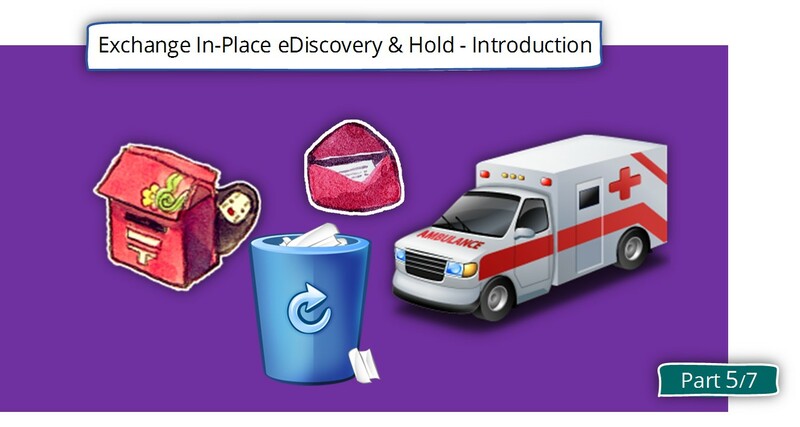 In the following section, we will demonstrate the way that we use Exchange Online in-place eDiscovery & Hold for searching and recovering mail items. 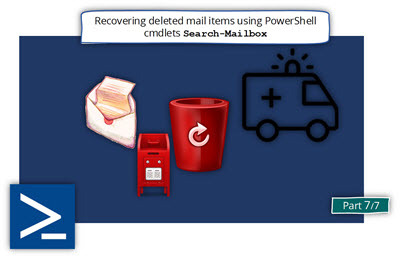 In our scenario, we get a call from a user named John that reports that he noticed that some of his mail are missing. John is not sure if the mail items were deleted in a specific date and cannot point out a specific charter of the mail item that deleted. 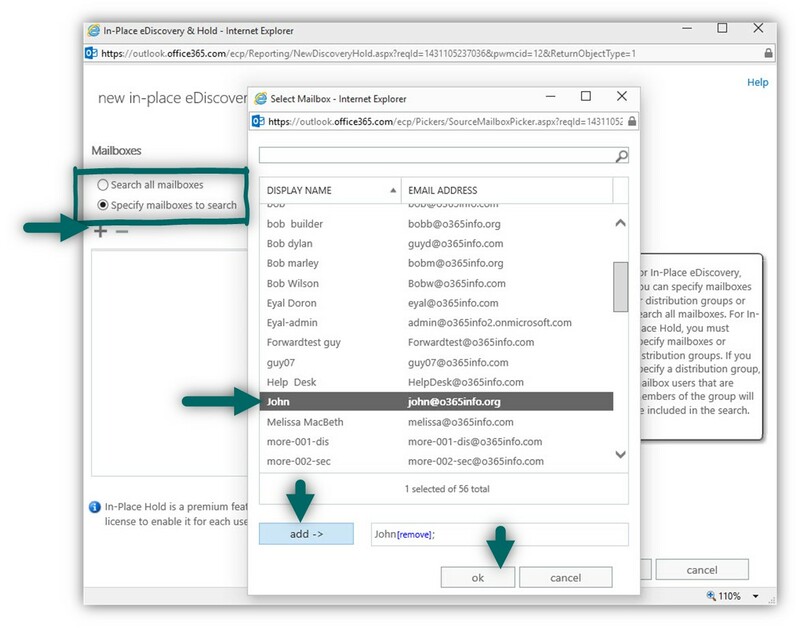 In this scenario, we would like to create a query that will “scan” John’s mailbox and “send” the search result of the – Discovery Search Mailbox. 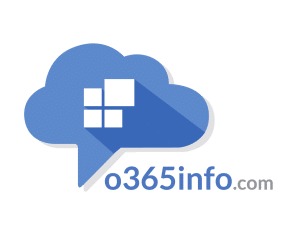 To be able to create an in-place eDiscovery & hold query, that will search through Exchange users’ mailboxes and in addition, enable us to view data from a user mailbox, we will need to have the required permissions. 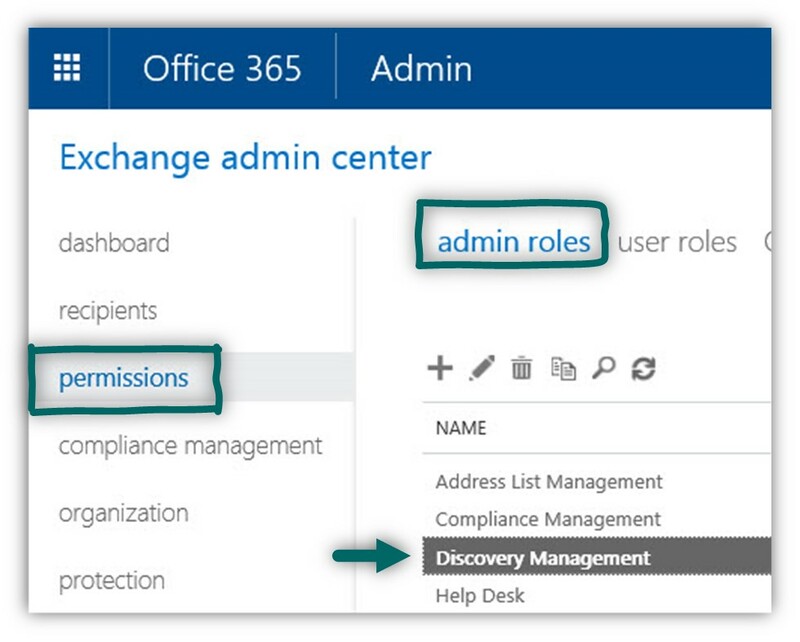 In the Exchange Online management portal, choose the permissions menu and then, on the top-bar choose admin roles. In the members sections, click on the plus icon to add the username that need to have the required permission (the user that will perform the In-place eDiscovery & hold search). In the following section, we will create the required in-place eDiscovery & hold search query. In our specific example, we will not create a specific filter, but instead, search the “whole of John mailbox”. In the text box – Name and description, provide the name for the -place eDiscovery & hold search query. Note – the name cannot contain spaces. In our specific scenario, we want to look at John’s mailbox. For this reason, we will choose the option of – specify the mailbox to search. In the window that appears, we will search for John’s name and then, click on the add button. In the following screenshot, we can see that the search query “boundary” is John’s mailbox. 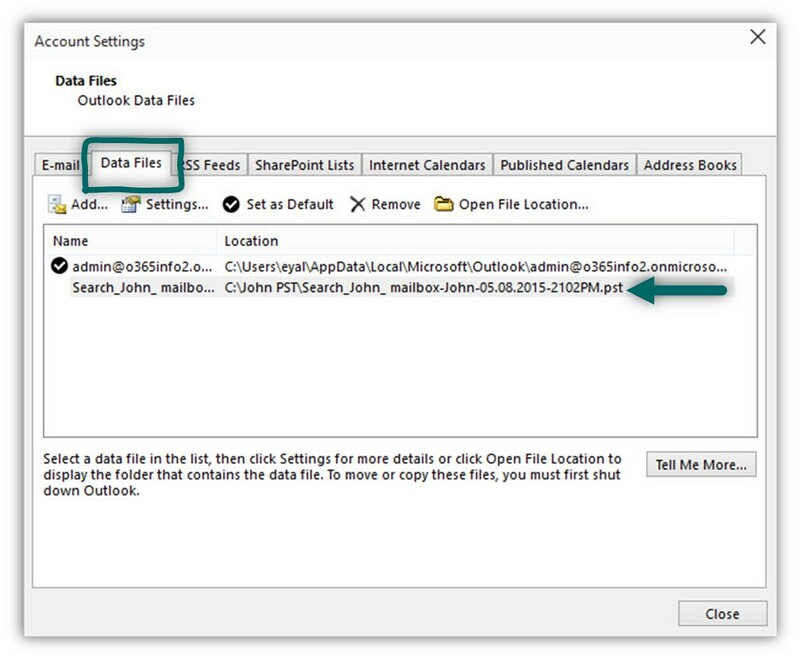 The following window enables us to set the specific parameters of the search query. In our specific scenario, we will choose the option of – include all content. Note – in case that the Filter based on criteria option is “dimmed”, this mean that you don’t have the required permissions. On the next screen, we will not select anything because this part is related to a scenario in which we want to put on hold particular mail items (our purpose is only to search and recover mail items). In the following screenshot, we can see we can see that the In-place eDiscovery & hold search query successfully created. In the following screenshot, we can see the In-place eDiscovery & hold search query that we have created. Notice that the status is Serach has been queued. 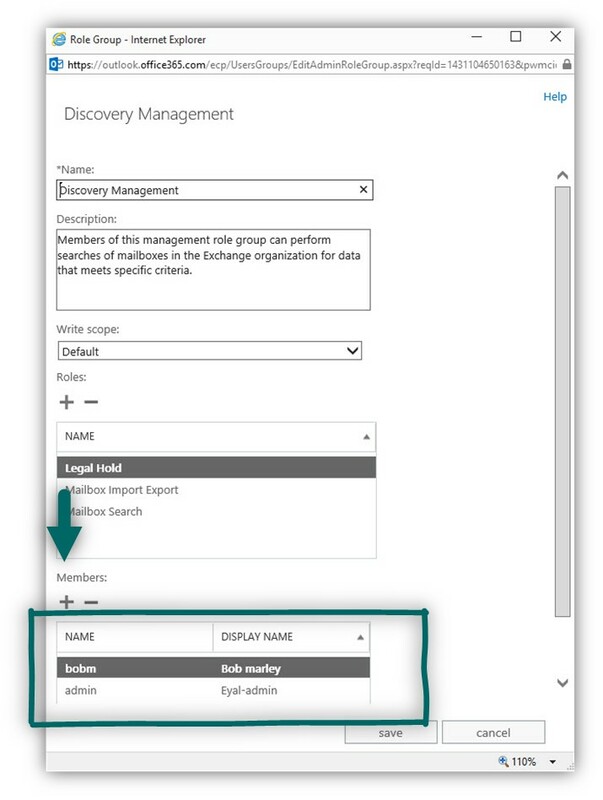 Exchange server needs some time to look for the required information in the Exchange index database. In the section, we want to “take a peek” in the search results, meaning the information (mail items) that was founded based on our search query. To view the information, click on the link – Preview search results. 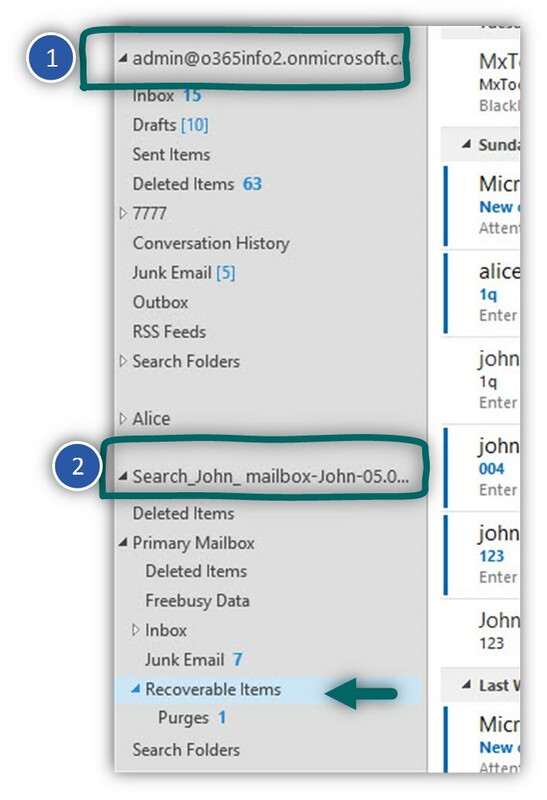 In the following screenshot, we can see the result search meaning – the mail items that appear in John mailbox. 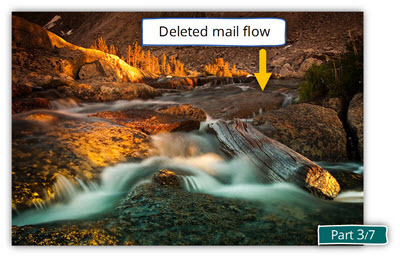 The meaning is that the view doesn’t include the “original folder structure and Hierarchy” as at appearing in the “original John mailbox”. From my experience, this “flat view” is suitable only in a scenario that the search result includes a few mail items. In the next section, we will provide a solution for this “display problem”. 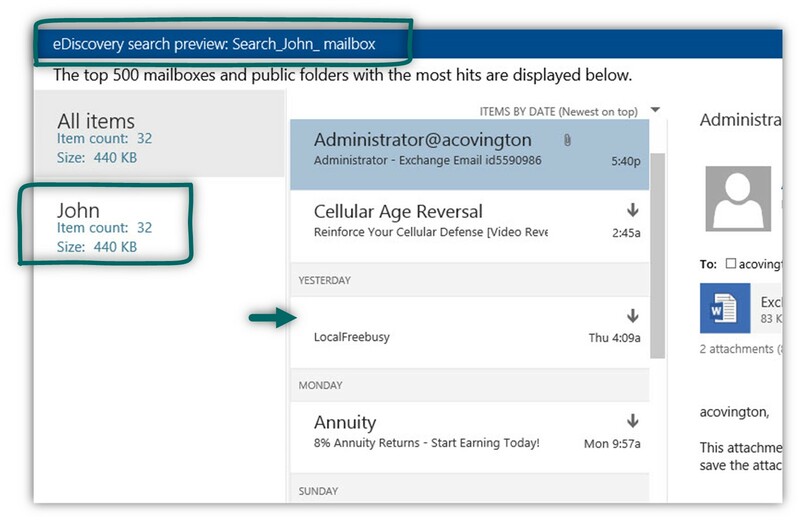 The option of saving the search query results to the Discovery Search Mailbox will enable us to get a clear view of the folder structure in John’s mailbox and also, save the information for later use. 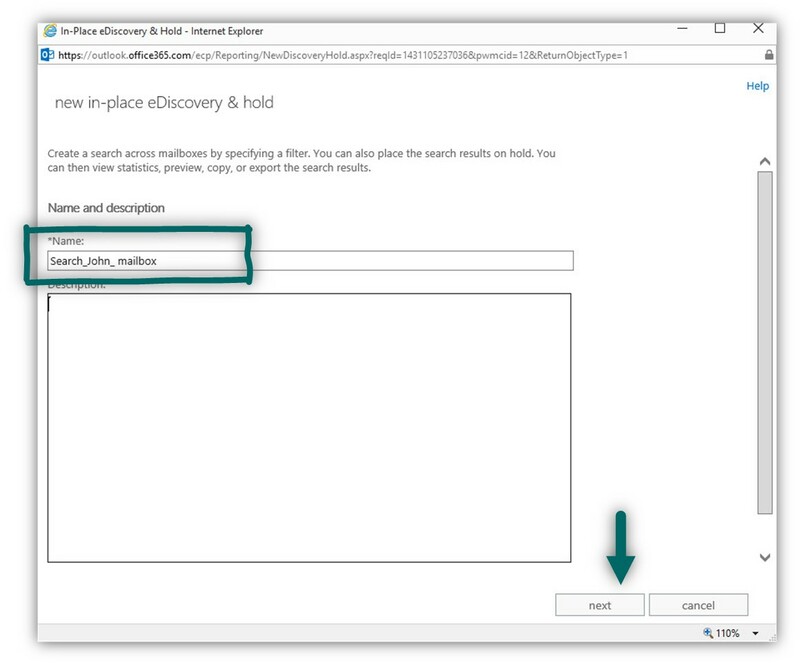 In the following windows, we will need to choose where to “store” the search query results. 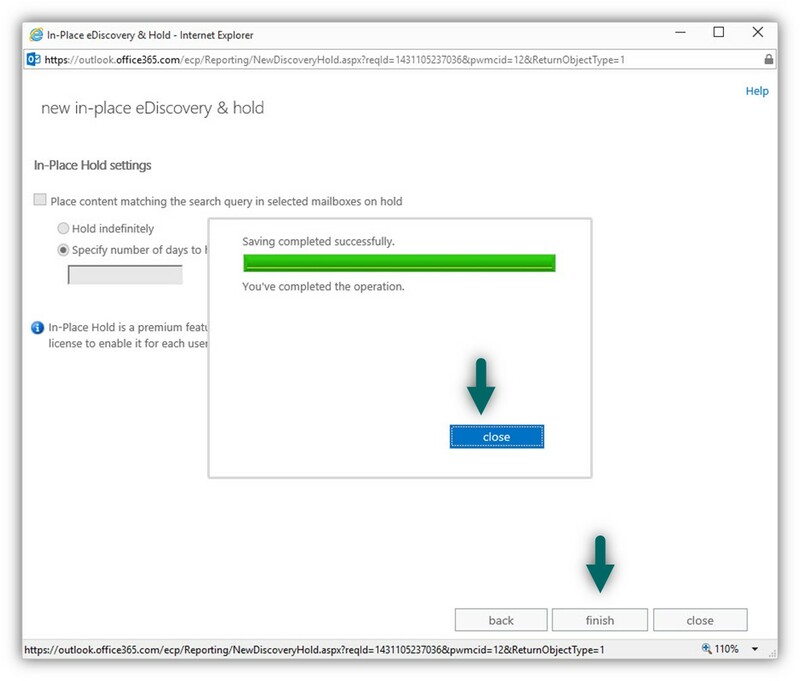 Technically, we can ask to create additional Exchange Discovery Search Mailboxes but for now, let’s satisfied in the “original” Discovery Search Mailbox. 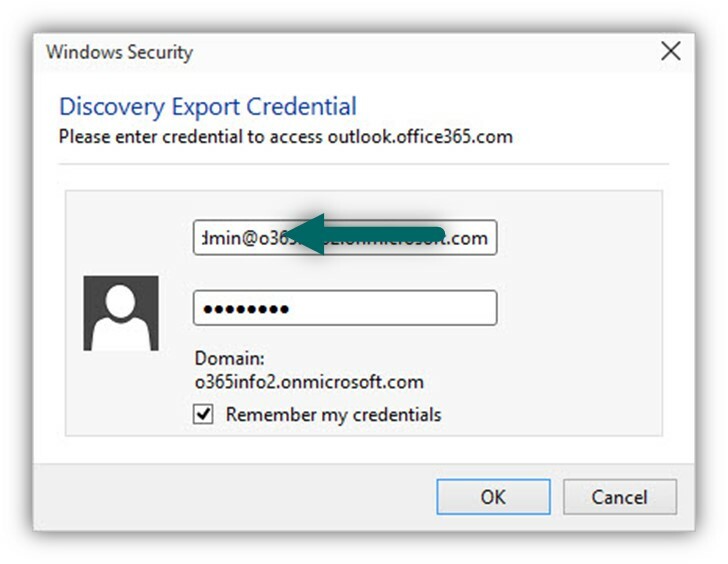 To finish the “export” (copy) process of the search results to the Discovery Search Mailbox, click on the OK button. In the following screenshot, we can see that a “new section” was added. In the following screenshot, we can see the content of the Discovery Search Mailbox. 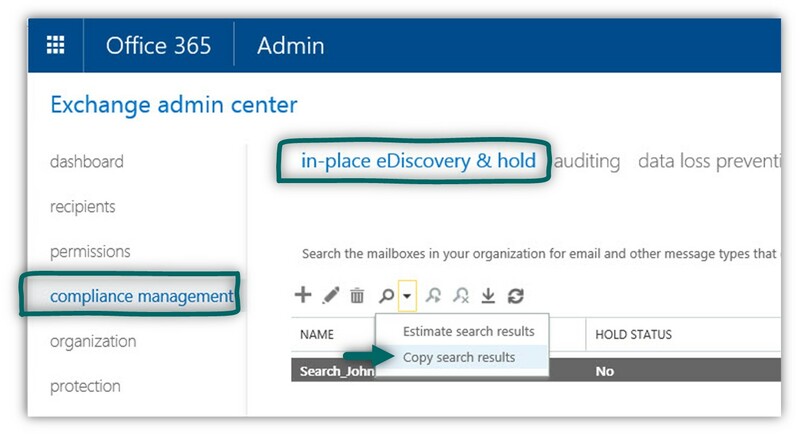 Pay attention to the logic behind the Discovery Search Mailbox structure. 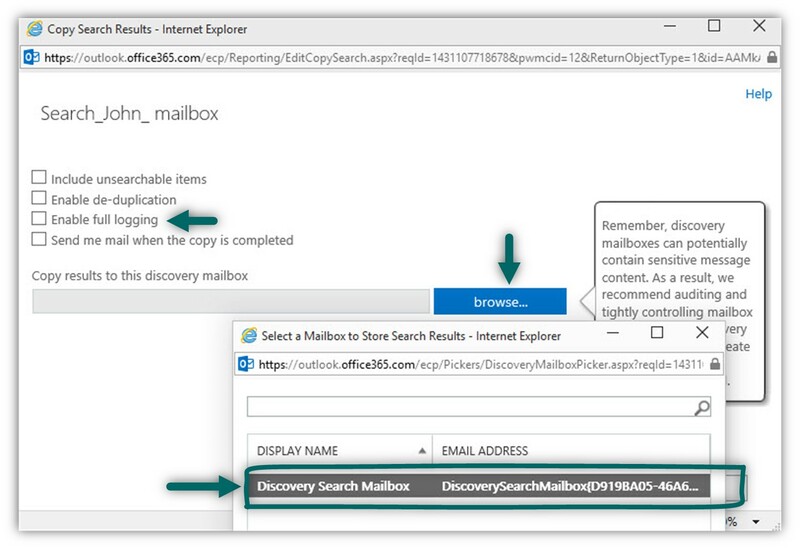 The search results that appear in the Discovery Search Mailbox have the structure and the Hierarchy as it seems in the “original mailbox”. For example, the default inbox folder and so on. 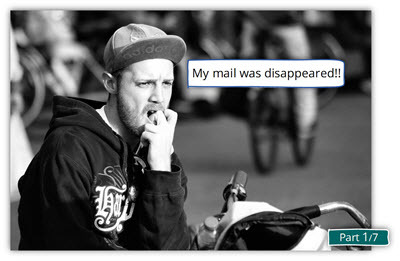 (In our scenario – Search_john_mailbox). Another interesting thing is that the search results include the Purges folder. This is the folder that will include “hard deleted” mail items and that cannot be seen or accessed by the mailbox owner (John in our scenario). A very useful option that includes in the In-place eDiscovery & hold is the option of exporting the search results to a PST file. 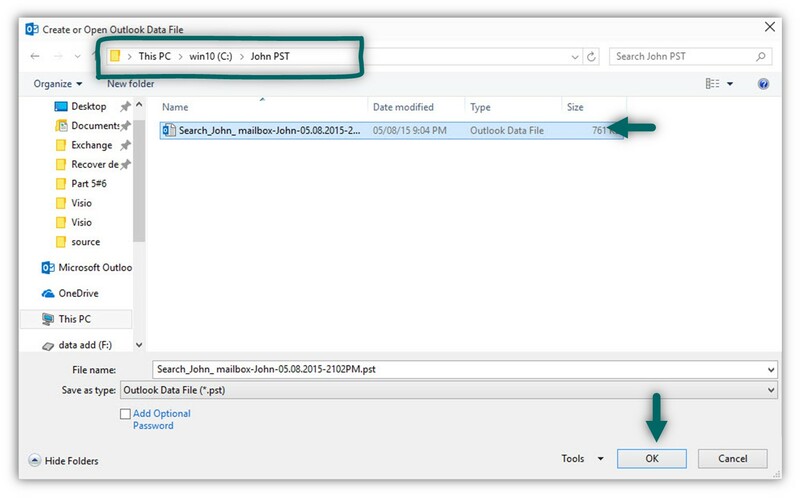 To be able to export the particular search result, we will need to choose the result search job (Search_john_mailbox in our scenario) and click on the down arrow icon (Export to a PST file). The export process is implemented by downloading a specific software component that will help us to download the file from Exchange Online to our local desktop. In the following screenshot, we can see an example, in Log file that provided as part as the exported files. The Log file includes information about every mail item that appears in the search result. 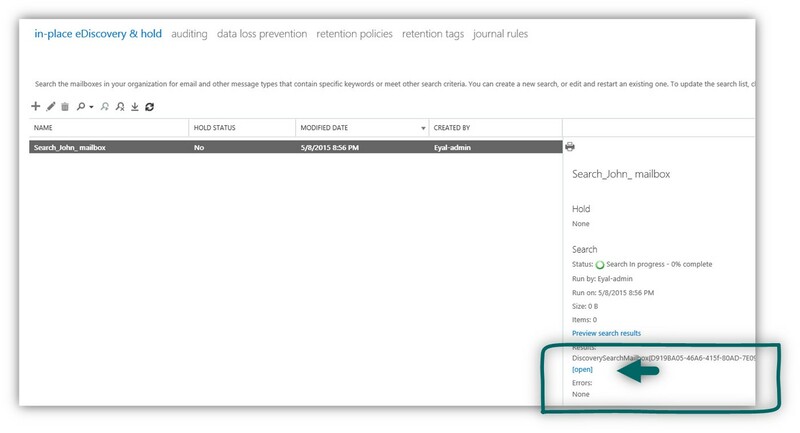 In the former section, we review the steps that are needed for exporting the search result to a PST file. 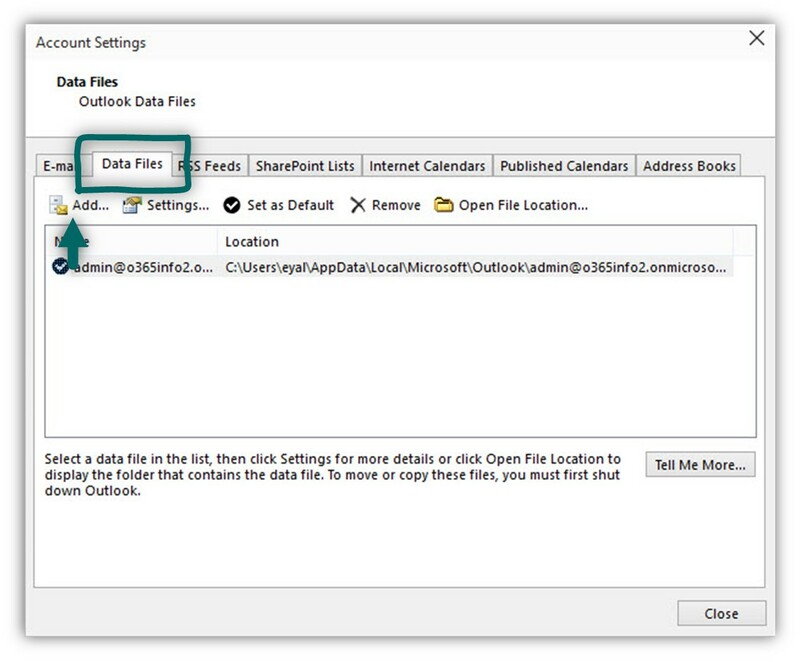 To be able to view the content of the PST file, we will need to add the PST file to existing Outlook profile. 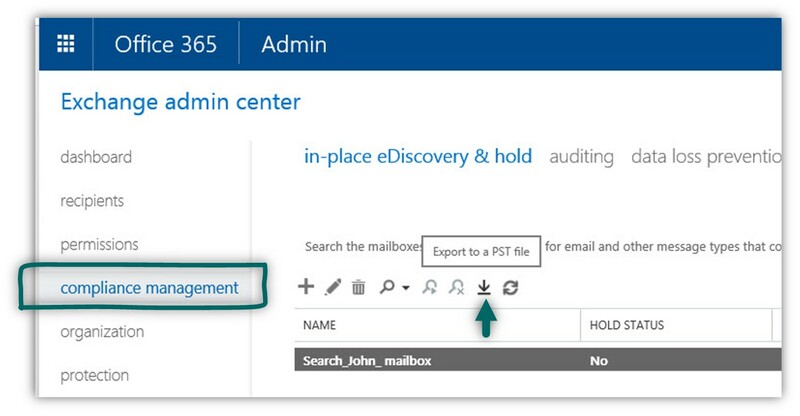 In the following example, we will add to existing Outlook mail profile the PST file that we got from the In-place eDiscovery & hold search result of John’s mailbox. 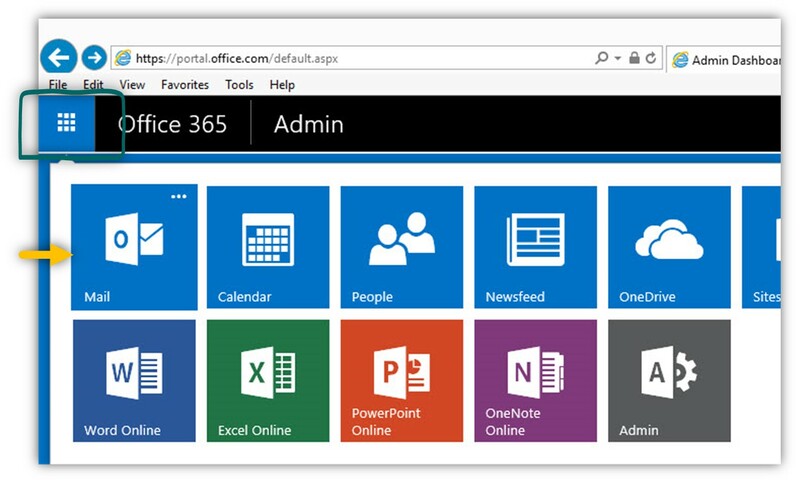 In the following screenshot, we can see the “new PST” file that added to our Outlook mail profile. 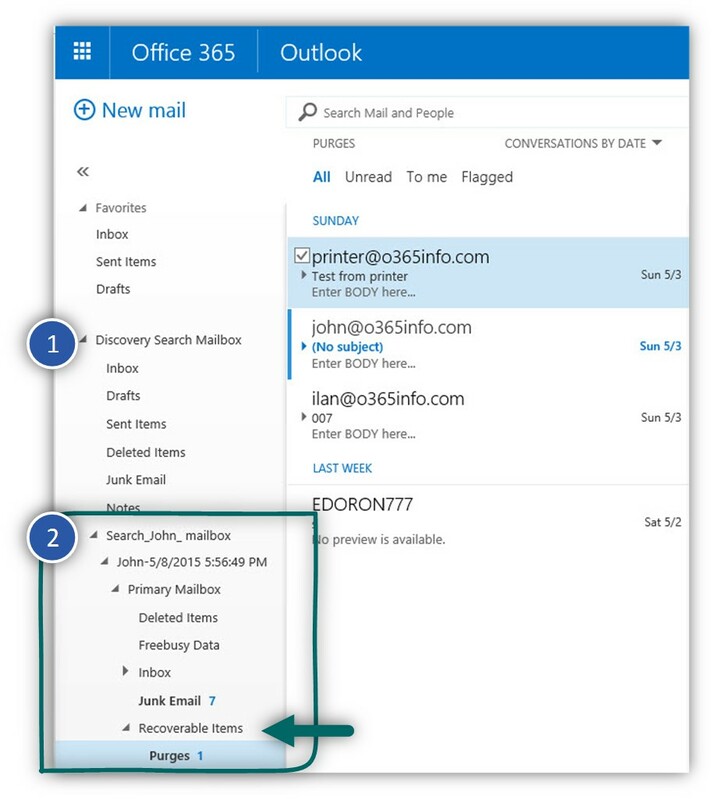 In the following screenshot, we can see “John PST” that appear as an additional mailbox in the Outlook mail profile. 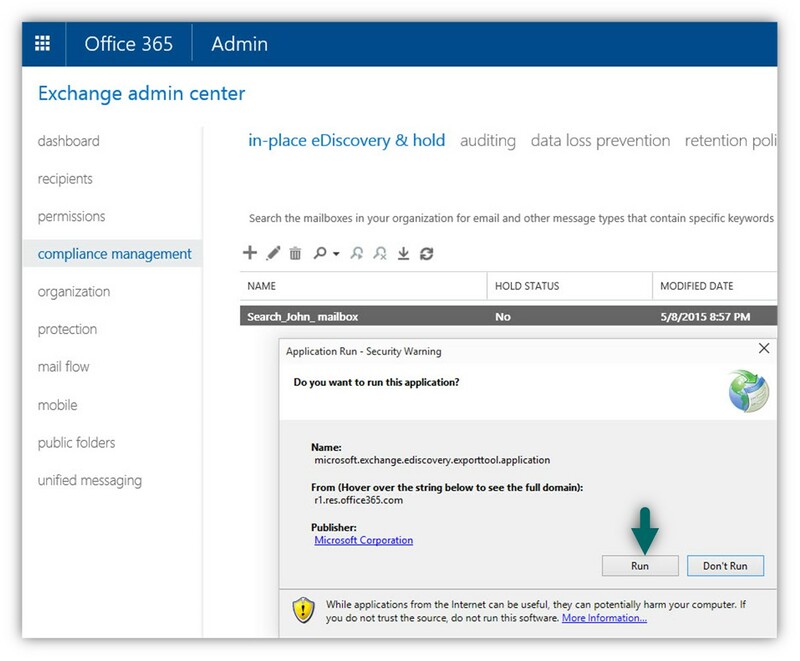 As mentioned, the option to use Exchange In-place eDiscovery & hold is available for Office 365 customers who have purchased Office 365 Business license but, not via the standard Office 365 portal admin interface. 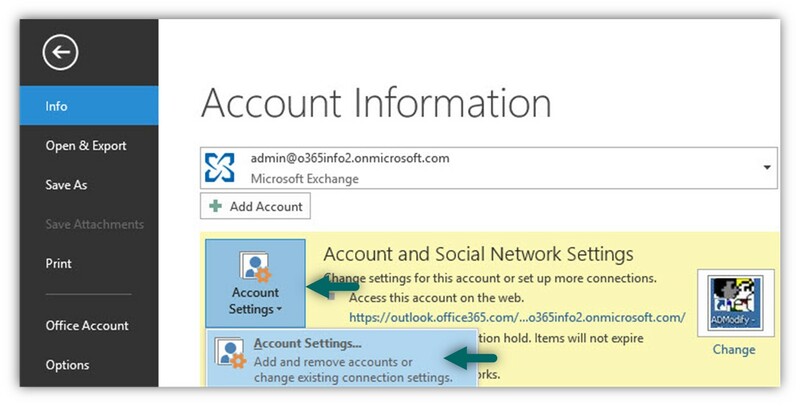 To be able to view the “Advanced Exchange Online” admin interface, we will need to use a little trick in which we will “rewrite” the URL address. 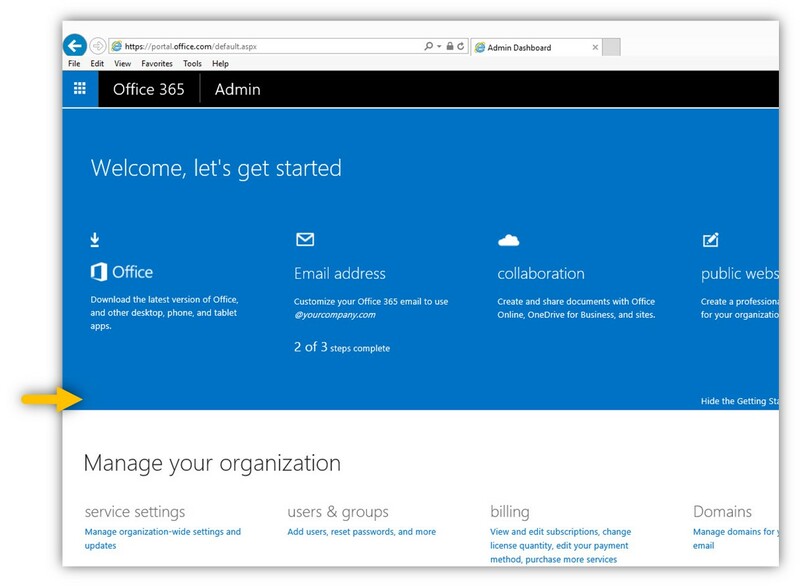 In the following screenshot, we can see that standard portal interface of Office 365 Business customer. In the following screenshot, we can see we can see that “standard” OWA mail client URL address. 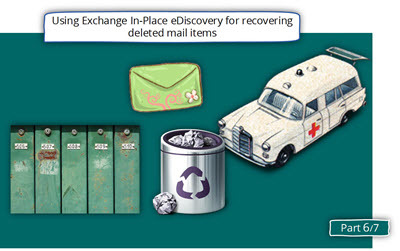 In the current article, we will review how to use the Exchange In-place eDiscovery & Hold feature as a tool for searching and recovering deleted mail items. We will review the following subjects: How to create an Exchange In-place eDiscovery & Hold query. 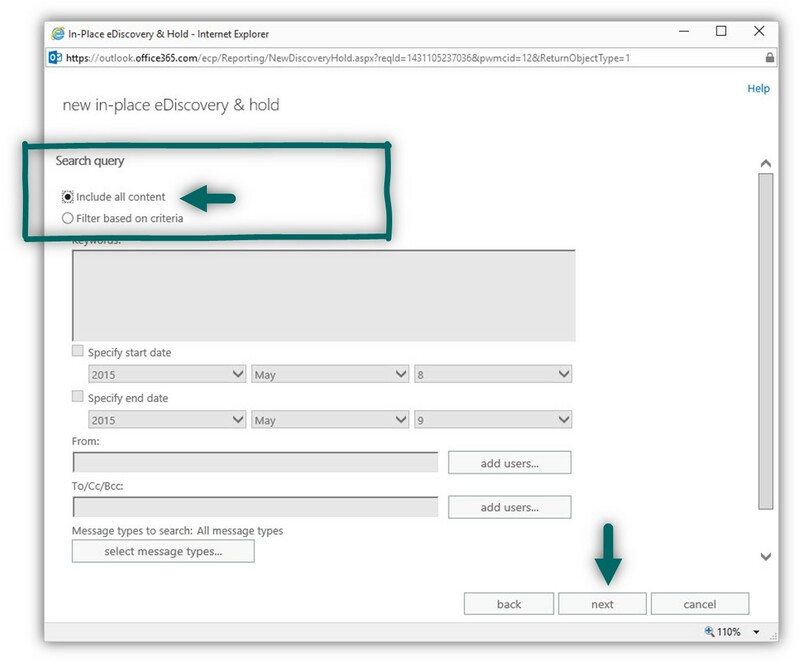 How to send a copy of the search results to the Discovery Search Mailbox. How to export the search results to PST file. 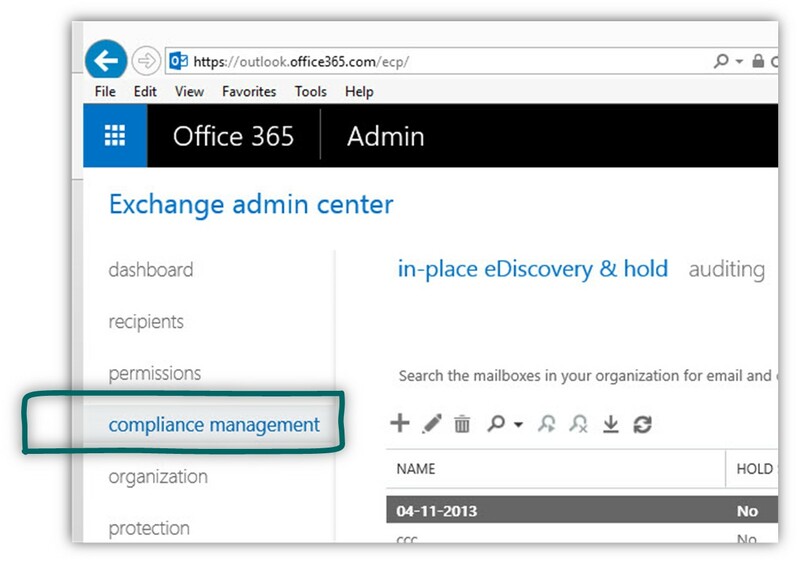 How to access the Exchange Online In-Place eDiscovery admin interface by Office 365 Business customers. 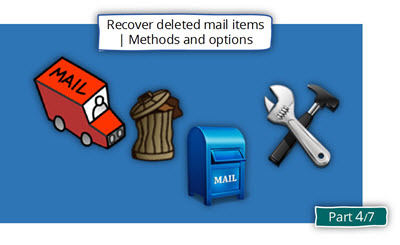 Is there a way to recover emails that were deleted by a rule? I mistakenly setup the rule and I’m trying to recover those emails. I tried following this but it seems it won’t recover the emails deleted by the rule. Please help!